Too often we look upon Georgian Dublin with rose tinted glasses; its well-laid squares exhibiting austere yet harmonious facades and magnificent door-cases in no way prepares us for the sumptuously opulent interiors secluded behind the brick elevations. Yet we neglect the squalor that was situated directly outside those very doors. We forget for instance that bootscrapers adjacent to the thresholds had more of a functional than aesthetic purpose. However this aspect of Dublin’s history is slowly finding its voice. Dr. Finnian O’Cionnaith’s recently published Exercise of Authority (2015, Four Courts Press) documented the decades of turmoil surrounding the lighting and paving of Dublin City. Dr. Patricia McCarthy has reassessed how the aristocracy of Georgian Ireland lived from day-to-day in her publication Life in the Country House in Georgian Ireland (2016, Yale University Press). Both of these authors, along with other eminent names associated with the history of the Georgian Era, are presenting papers at a seminar dedicated to life in Georgian Dublin. 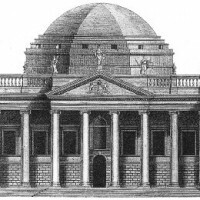 Organised by Dublin City Libraries and Archive, and hosted in the former Royal Exchange (now Dublin City Hall) as part of Heritage Week 2016, this seminar covers topics from construction and habitation to conservation and restoration. The seminar is being held on the 24th August and early booking is essential at dublinpubliclibraries@dublincity.ie or on 01 674 4806. *Cover image: Herbert Street, Dublin.